This slot machine is developed as the most simple, without a lot of fancy paylines. It is primarily recommended to novice players who do not want to spend time learning the rules of the game, so it can be called a light version of the slot machine. 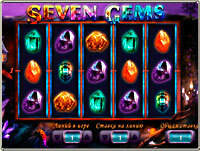 SEVEN GEMS slot machine supports only 5 playing lines, and gambling game has 6 steps to double. Bonus games are not provided, because the current rate of return of the slot machine is fully guaranteed by payout coefficient per lines in the main game. Objective of the game: by spinning reels, get a winning combination of the gems. A winning combination is the sequence of 5, 4 or 3 identical gems involving left and right reels. All winning combinations are paid according to payout table at the bottom of the page. Diamond symbol is wild and can replace any of the gems on the reels. If a wild symbol covers two combinations on one line, the combination with a greater coefficient is paid. The number of playing lines is set by pressing up and down arrows located next to “Lines” indicator. The cost of one credit equals to 0.01 xBTC or 0.1 xBTC. The reels are spinned by pressing SPIN button. As the player wishes, after payment in the main game, he may try to double win. To do this, press RISK. 15 closed cells will be shown to the player. To start gambling, the player shall click on any cell. When the player opens an empty cell, he loses current win. If a Diamond is in the selected cell, win will be doubled, and a new gambling game level will be offered, and one cell that does not contain a diamond will be automatically opened. Maximum number of levels in gambling game is six. The player can abandon another attempt to double, take win and return to the main game. To abandon gambling game, press SPIN. SEVEN GEMS slot machine has fair play control system. Below is a layout of 44 reel symbols. Fair play control system applies to the game per lines and gambling game. Reel offset can be set as described on Slot Machine Fair Play Control. The line RiskGame=0, 1, 0, 1, 1, 0, 1, 0, 0, 0, 1, 1, 0, 0, 1 determines the presence (1) or absence (0) of the diamond in the cell. The order of the cells is from left to right, top to bottom.